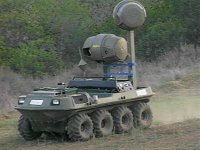 The Armed Robotic Vehicle (ARV) comes in two variants: the Assault variant and the Reconnaissance, Surveillance and Target Acquisition (RSTA) variant. The two variants share a common chasis. The Assault variant will remotely provide reconnaissance capability; deploy sensors, direct-fire weapons, and special munitions into buildings, bunkers, and other urban features; locate or by-pass threat obstacles in buildings, bunkers, and tunnels, and other urban features; assess battle damage; acts as a communications relay; supports the mounted and dismounted forces in the assault with direct fire and anti-tank (AT) weapons; and occupy key terrain and provide over-watching fires. The Reconnaissance, Surveillance and Target Acquisition (RSTA) version will remotely provide reconnaissance capability in Urban Military Operations in Urban Terrain (MOUT) and other battlespace; deploy sensors, direct-fire weapons, and special munitions into buildings, bunkers, and other urban features; locate or by-pass threat obstacles in buildings, bunkers, tunnels, and other urban features; acts as a communications relay; and assess battle damage assessment (BDA). 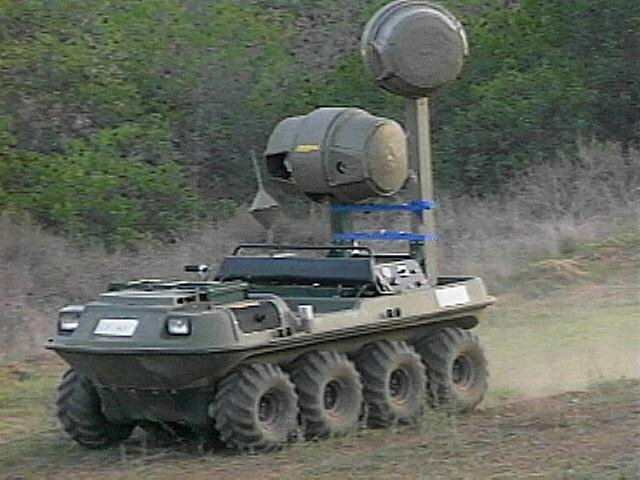 The ARV is a 5 to 6 ton unmanned ground vehicle (UGV). The ARV will be part of an organization of vehicles, sensors, C2 hardware and software systems, and communications systems. The ARV incorporates a turret system capable of launching missiles such as the Common Missile or Hellfire and operating a medium caliber gun system such as the 30mm Mk 44 Chain Gun. The ARV provides mobility sufficient to maneuver with the FCS force, and must be compatible with C-130 and CH-47 (internal) deployment. The ARV provides semi-autonomous navigation and mission equipment operations, with man-in-the-loop weapon fire authorization via the C4ISR network. In August 2003, United Defense was awarded a contrat by the FCS Lead Systems Integrator to aid in the design of both ARV variants. The General Dynamics Eagle Enterprise concept for the Objective Force Warrior [OFW] system of systems includes a Robotic Armored Assault System (RAAS) that may carry three weapon systems, including crew-served weapons, mortars and anti-armor munitions. The 15-foot long, six-foot wide vehicle will be capable of carrying a payload of up to 2000 pounds of weapons, supplies or personnel. 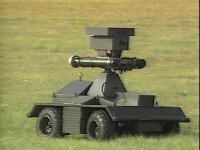 In early 2003 the Defense Advanced Research Projects Agency (DARPA) and the U.S. Army and their contractor teams unveiled Unmanned Ground Combat Vehicle (UGCV) technology demonstration platform to the public. The prototype now enters a period of extensive testing and refinement to validate the design performance characteristics and highlight capabilities enabled by unique design approaches. 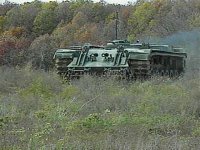 The rollout is an important achievement moving from design and simulation to the full-scale hardware testing needed to provide information to the Army for their FCS decision milestones. The UGCV prototype represents significant advances in vehicle design, and embodies a strategy for the kind of high mobility, efficiency, deployability, and resilience that will be needed to generate significant mission value to future forces. 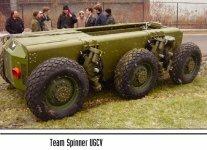 Team Spinner rolled out its seven ton version on 06 February 2003 in Pittsburgh, Pa. 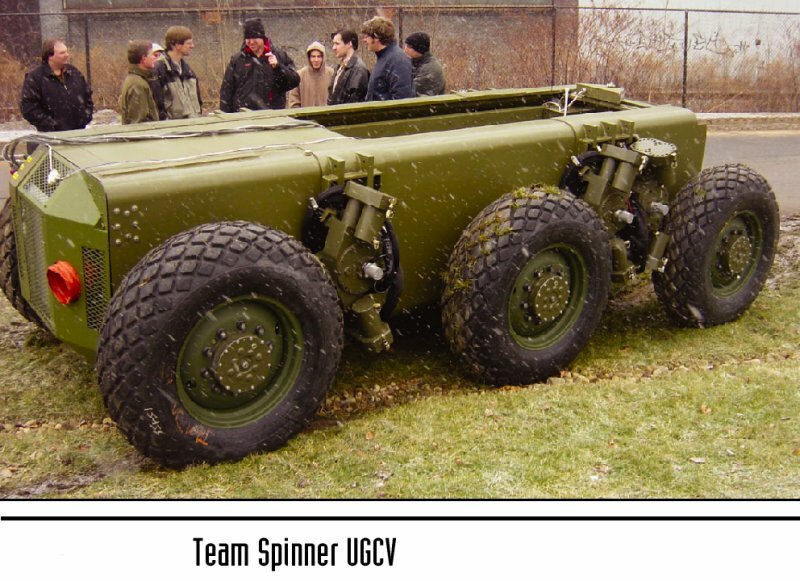 The Team Spinner UGCV will carry an assortment of payloads weighing approximately 4,500 pounds and is close to the size of the Future Combat Systems' Armed Reconnaissance Vehicle. 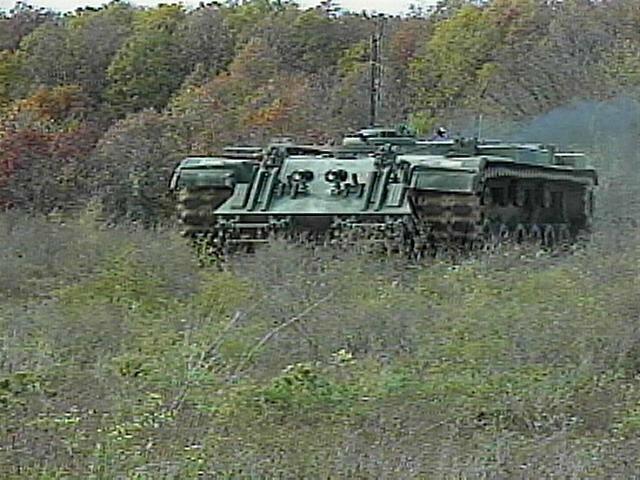 Team Spinner, lead by Carnegie Mellon University, includes team members Boeing, Timoney Technology, and PEI Electronics Inc.
DARPA and the Army sponsored the development of the prototype UGCV technology demonstration platforms as a part of the jointly funded Future Combat Systems (FCS) program. The design can accommodate severe events such as rollovers and continue operation upside down. It is configured for air drop and long-range operations to simplify early entry, and reduce their logistics burden. The vehicle is also highly mobile and can obtain very low profile configurations to reduce detectability. Power systems aboard the vehicle are advanced hybrid electric to provide long silent watch and movement as well as enable unique payload packaging strategies. On 02 September 2003 it was announced that Carnegie Mellon University's National Robotics Engineering Consortium (NREC), part of the Robotics Institute in the School of Computer Science, had been selected to be part of a team formed by General Dynamics Robotics Systems (GDRS) to negotiate toward a contract to develop an Autonomous Navigation System (ANS) for unmanned and manned ground vehicles. The choice of GDRS, a wholly owned subsidiary of General Dynamics Land Systems, was announced by the Army's Future Combat System integrator team, which includes The Boeing Co. and Science Applications International Corp. (SAIC). In the Future Combat Systems ANS program, the GDRS team will design, develop, integrate, test and manufacture a system capable of autonomously controlling any of several vehicles designated by the Army, including the Multi-functional Utility Logistics Equipment (MULE) platform, the Armed Reconnaissance Vehicle (ARV) and Manned Ground Vehicles. The ANS program will provide navigational, perception, path-planning and vehicle-following algorithms, as well as the requisite on-board sensor package for autonomous mobility. The National Robotics Engineering Consortium will be a major subcontractor to GDRS and will lead the development of perception and path planning within the Autonomous Navigation System. 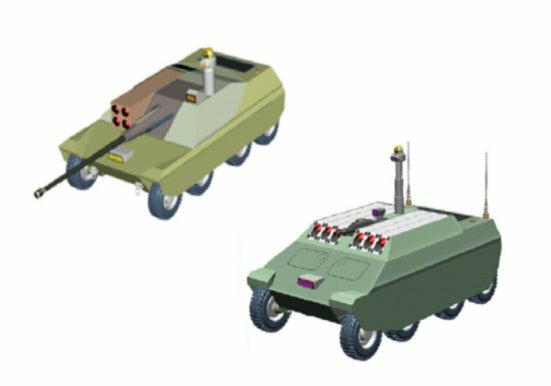 Development of a production-quality Autonomous Navigation System will advance the mobile robotics field and increase the safety of soldiers by eliminating the need for them to directly operate the Unmanned Ground Vehicle (UGV). The Robotics Institute and the NREC are leading robotics research and technology transfer organizations. Their presence on the team provides field-tested sensory processing and tactical planning. During the previous three years, the National Robotics Engineering Consortium had served as the prime contractor and systems engineer for four technology development programs directly related to Future Combat Systems Unmanned Ground Vehicles. 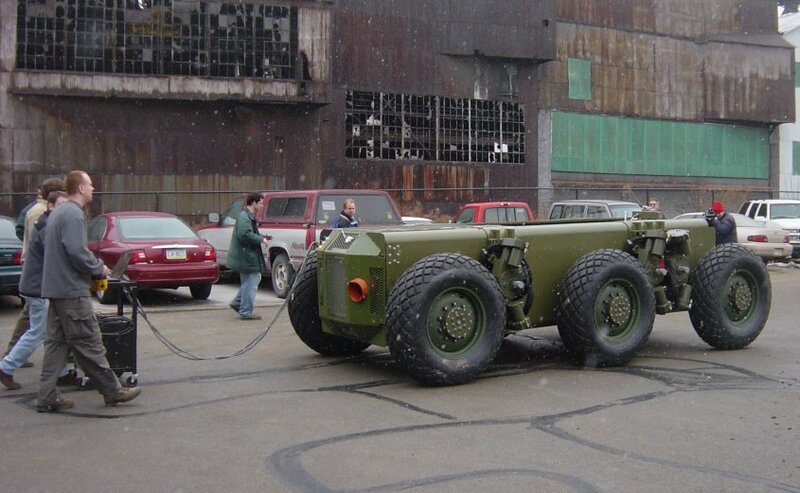 The NREC Unmanned Ground Combat Vehicle (UGCV) team designed and built a six-ton, fully invertible, six-wheel drive hybrid electric vehicle suitable for armed reconnaissance missions. Another NREC team was selected to build a half-ton, highly mobile UGV for the US Marine Gladiator program. The Marines also funded the Robotics Engineering Consortium to build Dragon Runner, a portable robot or "throwbot" that military personnel can throw over a wall or into a building to support urban reconnaissance missions.